Will not harm the grass, kids or animals. Works like hair dye. Will not wash off. Grows out with the grass when the grass starts to grow again. 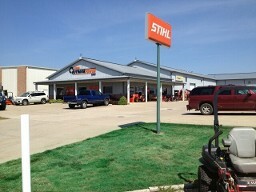 The grass then is green and this product is just mowed off. It's applied in a two coat application. 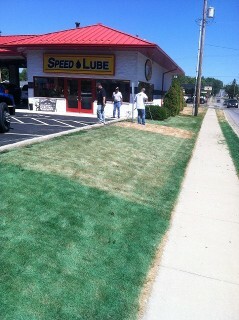 As seen in the picture on the left, the farthest patch of grass has no paint/stain. The middle patch of grass has one application and the closest patch has two applications. 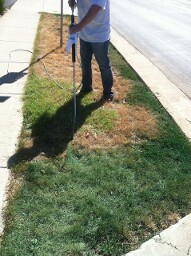 Who paints their grass? Anyone who wants to have the best lawn on their block, people who want instant curb appeal in order to sell, or anyone throwing a party or special event. Lawn Painting has been used for decades on Professional Sports Fields, Golf Courses, and Theme Parks. Lawn Painting is a simple solution to beautifying your lawn and keeping it perfectly green all year round! 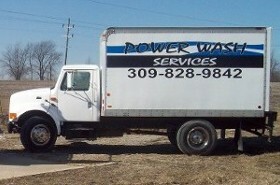 ls it safe for my kids, pets, & lawn? Yes. Our Grass Paint is organic, completely safe and non toxic. It does not have any harmful chemicals and is actually beneficial to the lawn. There is a recommended 2-3 hour drying period before allowing kids and pets on it just to avoid staining. Once it is dry it will not rub off. It looks and feels incredibly natural. Will it help the environment? Yes, Grass Painting is one of the newest, innovative ways to conserve and beautify the environment. Our grass paint is Biodegradable. Everyday billions of gallons of water are used on lawns that are still brown. This, along with the use of fertilizers and insecticides, is harming and polluting our water reserves. 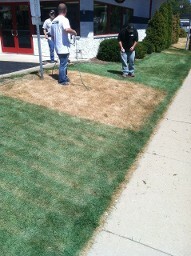 Once your grass is painted you do not need to fertilize or continuously water it. Less water means less maintenance. Will it wash away if it rains? No it is a permanent paint that has been used for many years on professional athletic fields & homes. It is very durable and long lasting. It is waterproof and does not fade or wash away from the surface. You will not need to continuously water your grass after it is painted. How Long will it last? About 3-5 months depending on season and mowing. Did you ever wonder how professional sports fields look so perfect all year round? Now you know. Yes, Grass Painting Is the answer. How long does it take to dry? Our Paint dries in 2-3 hours. What do I need to do before Grass is Greener paint my lawn? The lawn needs to be dry. It should be mowed, edged, and free of leaves or debris. 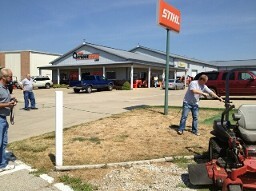 You can hire us to do the mowing and edging. When I mow my lawn and it starts to grow again will I see roots? No, the grass that is dead and not growing will stay green permanently. Grass that grows in, will grow in green and everything will blend beautifully.